Heraclitean Fire » Read The World: new country shock! I’m actually surprised that I’ve spent three years trying to read a book from every country in the world without any new countries being created… but it looks like that’s about to change. Kosovo seemed like the favourite to join the list, but it looks like South Sudan have beaten them to it. They’re not quite members of the UN yet, but they’ve been recognised by Sudan and the UN, so presumably it’ll be a relatively quick process. Given the appallingly brutal recent history of Sudan, I’m not about to begrudge them a peaceful separation, but I don’t think it’s going to be easy to find a South Sudanese author to read. Ho hum. 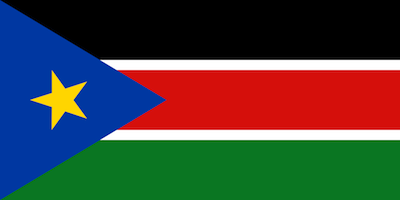 » The flag of South Sudan is taken from Wikipedia. If you’re looking for books from South Sudan, it actually turned out to be easier than I expected to find some; there are various refugee/lost boy/child soldier memoirs out there, including books by child soldier-turned-rapper Emmanuel Jah and refugee-turned-supermodel Alek Wek, boh of whom are from what is now South Sudan.